Lucky Bend Lookout is a full of views, warmth with an old cabin feel. The location is great, outside of crazy downtown but only by a mile. Sarah had done a great job stocking her place with so many things. Basically you only need to show up with your clothes and stock the fridge. We will be back! If you are looking for a relaxing, well-designed and decorated stay, this is the place. It has everything you need for rejuvenation. From a well supplied book shelves to a kitchen with many cooking supplies to kayaks and canoes docked on the Russian River, you never have to leave the house! And the location is so close to great vineyards and cheese trail. We had a fantastic stay. Sarah is extremely responsive. This is place is such a treat! Sarah's place is the perfect rental for a family especially if you have little kids. It was great to know our little toddlers were safe all around the property. We loved jumping in the river straight from the dock and enjoyed the fire pit each evening. Parking is easy, the kitchen is very well stocked, and the property is exactly as described. Thank you Sarah. Absolutely incredible. Every amenity you could ask for: kayaks, beach umbrellas, inner tubes. 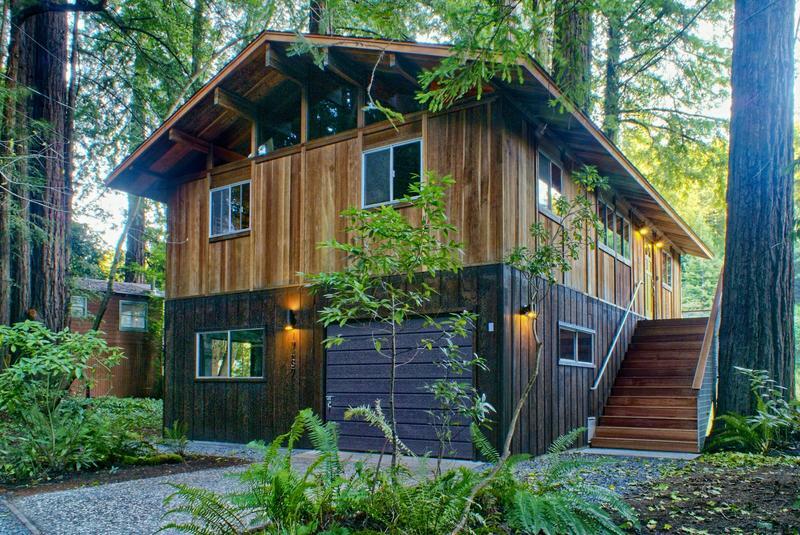 A gorgeous house overlooking the river and surrounded by old growth redwoods. A marvelous, responsive host. Truly a gem! Sarah's place is an architectural gem and is a special place to stay no matter what you're doing in Russian River. The home was clean, instructions were clear, and the organization household amenities make it a perfect place for a short or extended stay. I wish we had longer to enjoy the space, the river, and the area! Awesome place for families! We came here with another couple and three toddlers. The place is stocked with everything you need for kids, including a ton of toys, a toddler bed rail, and a pack and play. There were plenty of towels and a fully stocked kitchen! The location is perfect right on the river and a stones throw from town. The back deck was so relaxing and the set up is super comfortable. The hosts really did think of everything in terms of equipment and convenience. We will definitely be back! Thank you Sarah for being a great host! Clean, beauty, well-appointed! Great communication and support before and during our stay. Beds are super comfy. Lots of extras that made the stay great (including a super selection of games). If you have young children, they have you covered. Super family friendly but also appropriate for an adult getaway. This home is a lovely, cozy spot. Perfect for a family or small group of friends, and Sarah was great to interact with. This place was everything we expected it to be. A cozy cabin that’s off the beaten path, tucked into the redwoods and still close to everything you would need. My family was visiting from the Midwest and were especially impressed. We’ll be back! We stayed here this past weekend for a bachelorette party. Sarah was extremely communicative, answered all of my questions (I had a lot!) in a timely manner, and was very accommodating and friendly. The house was beautiful -- situated RIGHT on the river with a gorgeous wrap around deck. We really enjoyed the coziness of the house, and it felt very clean and well equipped. We were constantly pleasantly surprised with random tools and spices that we found in the kitchen -- definitely saved us a few store runs! I highly recommend staying here if you are looking for a getaway. Great for families, groups, or even a romantic weekend away! We stayed in the cabin for a long weekend of wine tasting and hiking. We have a family of 7 adults and we all fit comfortably with one person on the pull out couch. We loved having a table large enough for the whole family to sit at for dinner and cards. Sarah made sure to point out there was only one bathroom, which wasn't a problem at all - especially since there was enough hot water for all of us to shower after a rainy hike! Beautiful house and incredible location nestled among the redwoods and above the river (high above, so even with all the rain, no flooding). We visited with our two kids (almost 3 and 10) and confirm that this is a perfect place for families! Little guy especially loved the truck selection, and we appreciated having a beautiful spot to relax. Hope to come back someday and highly recommend. We had a delightful girls trip here! Well stocked kitchen, beautiful views on a relaxing deck, and even heated floors. Sarah was a very helpful and responsive host, really helping to ensure we had a great experience. Having your own private dock and water craft is the best. You just hit the river whenever you want and there are more water supplies/toys than I expected which was nice. Redwoods off the deck are awesome. Loved reading a book out there. Loved the fire pit too. Never ate out, always cooked in, so can't say anything about restaurants in town other than ice cream, though Safeway can sure get pretty busy. Having access to the washer and dryer was also key for us with a big group. Also remember that for a big group there is only one bathroom. This is of course not a surprise, but can make for some issues. Overall was cooler up there than I expected, not sure if that was due to the river's influence, or just a cooler patch of weather. TV with netflix was great for the kids at night. View out the window was great. M-4 Specialties wood shop up the road is quite a treat if you're into wood. The owners were very gracious with us. Beautifully updated riverfront cabin that's perfect for a family or a small group of friends who can share a bathroom. Contemporary decor with lots of nice touches. We had a very relaxing getaway and it was hard to leave. I especially miss the outdoor hanging hammock chair with river view; best place to while away a few hours with a good book! Our multi-generational family felt very at home and at ease in this beautifully renovated mid-century vacation home. Sarah goes above and beyond as your invisible host and guide to the area. Hands down the most thoughtfully kitted out rental home we've ever stayed at. Thoroughly enjoyed our stay and can't wait to visit again. Thank you Sarah! Why go to Muir woods when you can barbecue next to a giant redwood with a view of the Russian River? This river-side home is a dream - close to town for provisions but isolated enough to be a real escape - and the hosts are wildly attentive to ensuring that we had a great time. The kitchen was well stocked, not just for airbnb but for a personal kitchen. Also, it's incredibly kid friendly, in design and they also have a training potty, high-chairs etc. Why go to Muir woods when you can barbecue next to a giant redwood with a view of the Russian River? Wish we lived closer so we could stay there more often. Such a wonderful place to relax and enjoy family, friends and the wine country. We loved the view of the Russian River and the giant redwood trees from the deck and through those magnificent living room windows. The radiant floor heating is like heaven on earth. The modern kitchen made it easy to cook breakfast everyday. They did a wonderful job of bringing this beautiful home back to life. The national park with 300 foot old growth trees was only 15 minutes from the house. Our walk through these trees was peaceful and renewing. Tasting champagne was very fun as was the wine & food pairing at local wineries. We also took a leisurely 1 hour drive over to the Napa Valley for more wine tasting and a delicious meal. This house is the real deal for a weekend get away or a longer vacation. You will love it! Wonderful house with great kid friendly decor. Loved the windows and redwood ceilings and walls. The owners were very responsive to all my inquiries and provided a very accurate description of the property. Although there is no access to the river and no hot tub, the location, comfort and views made up for that. Downtown is about 15 minutes walking but some restaurants were even closer than that. Would recommend and hope to return in the summer when we can make use of the bbq and enjoy the deck with views of the river. You thought of everything, even cozy throws in all the rooms. We all had a great time! Our friends, my husband and I love wine country, so we are always on the lookout for nice vacation rentals where we can spend some time together. Our friends recently had a baby so it was important to find a space which is also kids friendly. Lucky bend Lookout was just the place! This property is set right on the river with redwoods all around you. The location is very picturesque and extremely inviting. It has an impressive deck overlooking the river where you can easily spend hours just enjoying the scenery. Within the house, the owners have taken painstaking measures to equip the place starting with all the kitchen amenities to baby playpens. We were extremely impressed with how well everything was organized which made it very easy to familiarize ourselves with the property. I would definitely go back to spend another weekend there! With the instincts and eyes of a true connoisseur, you have succeeded in accomplishing tranquil perfection. The architectural integrity, design, and layout you have combined with this beautiful decor and simple furnishings--it is apparent to all that no amenities have been overlooked. Thank you for sharing this slice of russian river retreat. I cannot wait to come back. My husband and I had a wonderful time at Lucky Bend Lookout. The deck in the morning looking out on the Russian River, birds singing, ducks landing-- was amazing. At night, the huge redwoods are spotlighted. The house is very comfortable, the couches, beds, all new and well done-- and I was 7 months pregnant at the time, so I'm a harsh critic! It was so easy to stay at Lucky Bend, all of the appliances and ammenities are user friendly and labeled for ease of access. This would be a great place to come with kids and/or another couple as well, since there's plenty of space. Nearby attractions include hiking in redwoods, trips to the beach-- plenty to do or just relax. We can't wait to come back! Thank you so much for a wonderful stay! The house was immaculate and we especially appreciated all of the effort that went into the welcome guide that you provided. We wished that we could have stayed longer! You have such a lovely home. The heated floors, comfortable bed, beautiful view out of those incredible windows and wonderful deck made for a cozy retreat and first vacation with our twins! We will defnitely be back--hopefully for a bit longer. P.S. The babies enjoyed their first ride in the swing! I always get nervous renting from VRBO but Sarah does a great job of reflecting what this cabin actually looks like in her description and pictures. The location and cabin were amazing, so tranquil and the deck overlooking the river was difficult to leave. The cabin itself was well-stocked, very clean, easy to cook in and easy to find. Sarah did a great job communicating throughout the process and even sent us a bunch of google maps ahead of time that were helpful in planning activities throughout the weekend. We look forward to renting this gorgeous cabin again! We loved our stay. The property was impeccably clean and the best stocked rental we have ever stayed in. The view of the river is beautiful. The owner was very helpful in answering questions. I would definitely recommend this property to both friends and relatives. We had 2 small children and it was perfect for them as well. We would recommend Armstrong Woods and the beach is not far at all. Though it sleeps 8, it works best with 2 adult couples for privacy. Great place and would definitely go back. I spent hours pouring through all of the possible rentals for our nearly two week stay in Guerneville. With two young children, we really wanted a space that was kid friendly, well-appointed, and in a good location, what we got with Lucky Bend Lookout was beyond our expectations (and I had high expectations from the pictures). First off, the cabin home is completely restored to it's original Mid-Century glory, with modern updates that made it comfortable and livable for a 21st century family. The kitchen is fully stocked with everything we needed to create home away from home. There are indoor/outdoor eating spaces. The deck overlooks a peaceful stretch of the river, and has been redone to make it modern, and child safe, which created additional space for our family to hang out. There are swings beneath the deck! The cabin is quiet and serene, and only 2 minutes from town. When you book with this family, they email you a packet of pdf's for planning your visit, including information on farm dinners, local restaurant recommendations with personal reviews, information on which river beaches to go to, local trips, wineries, things to do with kids. It was so well organized, we spent little time planning in advance.